Anti-parasite responses of the snail Biomphalaria glabrata involve antigen-reactive plasma lectins termed fibrinogen-related proteins (FREPs) comprising a C-terminal fibrinogen (FBG) domain and one or two upstream immunoglobulin domains. FREPs are highly polymorphic; they derive from several gene families with multiple loci and alleles that are diversified by exon loss, alternative splicing, and random somatic mutation (gene conversion and point mutations). Individual B. glabrata snails have dynamically distinct FREP sequence repertoires. The immune relevance of B. glabrata FREPs is indicated by FREP binding to polymorphic antigens of (snail-specific) digenean parasites and altered resistance of B. glabrata to digeneans following RNAi knockdown of FREPs. The compatibility polymorphism hypothesis proposes that FREP mutation increases the range of germline-encoded immune recognition in B. glabrata to counter antigenically-varied parasites. Somatic mutation may result from sequence exchange among tandemly arranged FREP genes in the genome, and analysis of sequence variants also suggests involvement of cytidine deaminase-like activity or epigenetic regulation. Without current indications of selection or retention of effective sequence variants toward immunological memory, FREP diversification is thought to afford B. glabrata immunity that is anticipatory but not adaptive. More remains to be learned about this system; other mollusks elaborate diversified lectins consisting of single FBG domains, and bona fide FREPs were reported from additional gastropod species, but these may not be diversified. Future comparative immunological studies and gene discovery driven by next-generation sequencing will further clarify taxonomic distribution of FREP diversification and the underlying mutator mechanisms as a component of immune function in mollusks. CMA acknowledges support from CETI and NIH grant number P20GM103452 from the National Institute of General Medical Sciences (NIGMS). 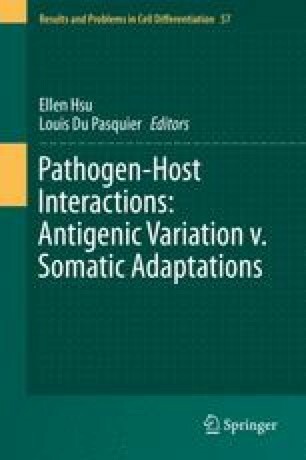 Moné Y, Gourbal B, Duval D et al (2010) A large repertoire of parasite epitopes matched by a large repertoire of host immune receptors in an invertebrate host/parasite model. PLoS Negl Trop Dis 4. pii: e813. doi: 10.1371/journal.pntd.0000813.